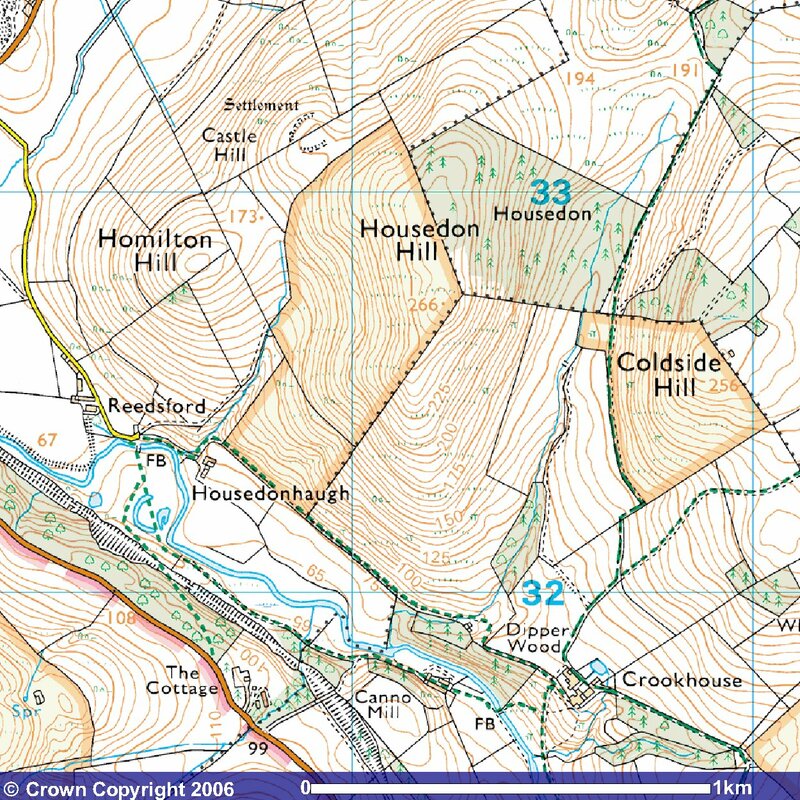 Housedon Hill is the lowest summit in the SB group, the most northern summit in the English SOTA Association and indeed there are more than 80 summits of the Scottish Association, Southern Scotland region that are further south than this. Housedon hill from the east, a deceptive view. The summit which cannot be seen from here, lies along the edge of the trees almost centre of picture. To the south of Housedon Hill lies The Cheviot and to the north west are the Lammermuir Hills so while this is a summit, it is from a VHF perspective rather like being in a valley. The summit can be and has been activated on VHF 2m FM but this can be a struggle. Recent activations have made FM contact into the Edinburgh area with a vertically polarised beam. 2m SSB has been successful but this still proved difficult and contacts with the Birmingham mafia were only just managed with 50 watts to a 3 element beam. There is VHF take off into the Hawick to Berwick valley but there is not a great degree of simplex VHF in this area. VHF Paths into the Tyneside area are not great but possible with a beam, indeed anything less than a beam from this summit is likely to fail. HF has a much better chance of success than VHF where in particular the 5 MHz band works well. There are two suggested routes to this summit, one which was developed and used prior to the implementation of CRoW at end May 2005 and another that is probably now the preferred route starting from Reedsford. The north west shoulder of Housedon Hill became "open country" at the end of May 2005, and it is rather puzzling that the south east shoulder, which is virtually the same type of terrain did not. The summit of this hill at 267 metres is just inside the trees that traverse the summit roughly in the middle of the line of the trees but in fact almost anywhere along that edge of the trees with its old fence and wall is within the activation zone. A minor summit at 266 metres about 200 yards south of the main summit is also within the activation zone but it is out in the open while along the edge of the trees there are a number of old fence posts that will provide mounting opportunities for antennae and although mostly collapsed the wall can provide some degree of shelter from the wind. Image produced from Ordnance Survey's Get-a-map service. Ordnance Survey of Northern Ireland. Note that "open country" is indicated by the light yellow shading. From the south take the A697 north off the A1 just north of Morpeth, passing through the Northumberland villages of Longframlington, Longhorsley, Powburn, and Wooler and shortly after leaving Wooler at the small hamlet of Ayton take the B6351 signposted for Kirknewton. A short distance after Kirknewton just before you reach a few houses at Westnewton, you will see a Northumberland National Park sign where you stop to take the Westnewton Approach. For the Reedsford Approach continue on past Westnewton for about two miles and just beyond the village of Kilham, turn right following the B6351. The road markings are slightly strange here since while the numbered B6351 turns right at this point, the minor road that continues onward is given priority. A short distance after this junction, the B6352 comes in from the left, while you continue straight ahead on the now B6352 for just under ¼ mile where you turn right onto a narrow single track road that leads to Reedsford and Housedonhaugh. Beyond Reedsford farm the road is not really suitable for cars and parking by the road side, or with the permission of the farmer, at the side of the farmyard, is possible. From the north west take the A697 south off the A68 at Carfraemill and after passing through Coldstream and crossing the border into England, proceed to about 1 mile north of Milfield where you take the B6352 to Kilham. About ½ mile before Kilham you take a left turn into a narrow single track road to Reedsford for that approach or continue straight ahead for the Westnewton approach . A short distance before Kilham the B6352 goes off to the right while you continue straight ahead on the now B6351. Shortly after that, at a T junction, turn left through Kilham and for about 2 miles to Westnewton. From the north east take the A698 off the A1 at the roundabout on the Berwick bypass, to Cornhill on Tweed where you join the A697 and proceed as for from the north west. Activation of Housedon hill where old fence posts can be used to support antenna masts and the wire fence may enhance 5 MHz NVIS. The wall provides a degree of shelter from the wind. After parking either on the roadside or the the edge of the farmyard (the farmer if asked, has been quite amenable to that) follow the farm track to the left rather than the road towards Housedonhaugh, past the sheep pens. At the end of the track, turn right and cross a swampy area of land, through which a stream flows, and proceed onto the shoulder of the hill. If you are really fit you can then climb straight up the shoulder of the hill to the summit that is along the edge of the trees which traverse the summit - that direct approach requires a section of climb of 100m in a distance of 270m or a gradient of 37%. For a gentler climb, head upwards but across the shoulder in a north north east direction and as the incline lessens, turn progressively toward the west, your track forming a large arc, eventually approaching the summit from the north west. According to detailed maps the summit lies just beyond the tree line however on the other side of the wall, near a prominent old fence post in the wall, there is a small pile of stones that appears to be the start of a small cairn representing the nominal summit. There is parking for one car just by the Northumberland National Park Sign at NT 90563 30381 on the eastern edge of Westnewton. From there proceed through the gate slightly to the east and follow the rough track/road to cross the river. Over the river follow the rough field road right to the edge of the wood and then turn sharp left to follow the unsigned public footpath which runs along the north side of the river along the edge of the wood towards Crookhouse farm. As the track turns up from the river toward the farm the first footpath sign appears but as you approach the fence at the top, the signs point only to the left which is a possible route to take but currently not the easiest route from here. This footpath to the left traverses the edge of Housedon Hill around to the north west shoulder which became open country at the end of May 2005. For now, you are best to follow the old now disused farm track as it bears right and pass in front of the farmhouse, then left through the farm yard to where a sign on a gate post on the other side of the farm points to the bridleway. Housedon hill from the south with the minor summit at 266 metres visible. The main summit at 267 metres is approx 200 yds beyond. Follow the bridleway where it branches left off the main track at NT 90670 32050 and just after a gate in the fence at NT 90670 32180 the bridleway kinks to the right following the fence up hill and passes through another gate at NT 90710 32215 turning left onto the shoulder of Coldside hill where it runs along the edge an area "open country" that goes up to the summit of Coldside Hill. As you approach the woods, the area that has become "open country" extends down to the stream at the bottom of the valley but the land is very marshy and best to avoid. The climb is probably best along the inside edge of the woods since the land on the outside of the wood will not be "open country". At the top of the hill, the land between the wall that runs south west down the shoulder of the hill and the fence running north west along the edge of the woods and includes the summit, became "open country" at end May 2005. At the top, follow the fence to the right for about 210 yards to the summit which is not all that obvious but near a vertical wooden post in the wall, the presence of a small pile of stones just on the edge of the wood suggests the start of a cairn. If you have a GPS it should indicate something like NT 90219 32901. You will see something resembling a summit at NT 90235 32740 much more in the open shortly after you reach the top of the climb along the edge of the woods and which some authors have suggested is the the summit but the OS map would indicate that may be a minor summit at 266m. Some work needs to be done here to clarify exactly what qualifies as the true summit. Fortunately whatever is the true summit, both spots are within any activation area. For refreshments after activation, if you are returning south there are a number of bars. shops, cafes and a fish & chip shop in Wooler. For more details see the Post Summit Retreat details on the G/SB-001 page. If returning north or north east your best bet is one of a number of bars in Coldstream. If heading for the south west, once heading north west on the B6351 you could continue straight ahead just beyond Kilham where the B6351 takes a right turn at a junction, and follow the minor road that for some way follows the Northumberland National Park boundary and eventually leads to Kirk Yetholm where the Border Hotel (open from 11:00 am.) at the end of the Peninne Way has provided refreshment for many a long distance walker completing the 270 miles. Another pub can be found just beyond Kirk Yetholm, the Plough Hotel, a 17th century coaching inn, in Town Yetholm. Last updated 13h June 2009 - Please report any issues or errors - even spelling! !